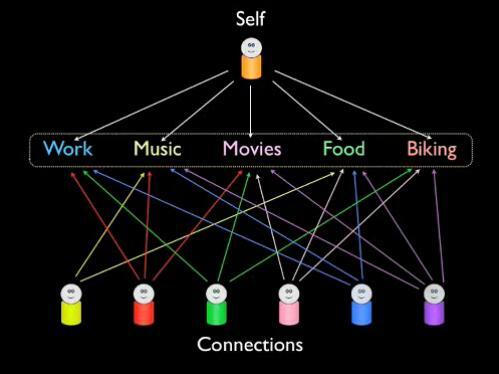 Picture taken from Thomas Vander Wal's presentation, Granular Social Networks. Thomas Vander Wal recently posted a great short presentation, Granular Social Networks. In it he tracks the complexity of relationships within and across networks, making interesting and important points about the overlapping of interests and following behaviours between connections. The only thing that I'd be keen to stress a little more would be the relatively haphazard relationship most followers necessarily have within social networking service relationships. While most of us have very few connections that we engage with across the entire range of their interests, activity and expertise (stalkers, the love lorn and private detectives aside). Similarly, even amongst those connections that we have an identifiable interest in - for example, I'm interested in your music consumption and recommendations - it's not usual to keep track of every single recommendation or playlist. There are just too many other things going on. So to a certain extent I don't believe that greater control - i.e. finer granularity within network channels - is the answer ( & you can check out my post on in service granularity here for further elaboration). While intellegent and sensitive service design, along with user digital literacy are important, a philosophical acceptance of serendipity and a kindly understanding of the human limitations for data absorption are also useful. In the words of a Jaiku conversation I had with Terry Madley earlier today: "or maybe, only learn not to mind so much about the inevitable periods of disconnection. It's kind of good to not think about the info streams as if they were linear, let alone might constitute any kind of linear narrative. Maybe this is one of the reasons why lifestreaming is popular - the illusion that if you could somehow keep track of everything, there'd be a coherent story at the end of the rss rainbow." The other issue that Thomas touches on is another of my current bug bears - signal v noise. I wanted to post here primarily to put on the (blog) record that both signal and noise are entirely subjective concepts. They aren't even stable. What's noise to me on Tuesday morning might be be signal from heaven on Wednesday evening - when I might desperately be in need of an inspirational line of poetry, or the reassurance that all is well in someone's household, or a link to a resource or an idea that helps me think through a presentation I'm writing. The signal vs noise distinction often implies a judgement call. The reference Thomas makes is entirely free from this implication -in fact his presentation couches the distinction as personal definitions. I'm just keen to draw attention to the fact that what is signal and what is noise doesn't consist of objective content that we can necessarily pre-determine. Interesting. I think your distinction between signal and noise emphasises the importantance of spatial and temporal dimensions to social activities (of all kinds) - we do the things we do in time and space and out relationship to that context is not fixed. Interesting post Josie, and I agree with Rebecca's comments too. It is one of my beefs with an over-emphasis of counting links in social networks, at the expense of looking at the quality of the links.